Legends photographer Wayne Gallasch has selected another of his classic photos from his archives, and is releasing this image as a limited edition signed and numbered full color poster. This second poster released in our LEGENDS COLLECTION is a classic shot of FRANK ZANE taken by Wayne in 1972 in Hyde Park Square, London, England on the day he won the NABBA Professional Mr. Universe title. ONLY 100 PRINTED – Large A2 size. Printed on heavy 240gsm SATIN art paper and produced to the highest print quality. Only 100 posters have been printed and each poster will come with a Certificate of Authenticity with a unique number, signed and dated by Wayne Gallasch. WE CAN THEN CHECK ON THE AUTHENTICITY OF ANY SUCH POSTER BEING LATER OFFERED ON THE INTERNET. This incredible collector’s item costs only $60 + postage and handling. The exact shipment cost can be quoted depending on where you live. Email tina@gmv.com.au for a PayPal invoice, along with your SHIPPING ADDRESS. Our invoice will then be emailed to you along with the correct postage, and can include insurance if requested. See also our FRANK ZANE PHYSICAL PERFECTION DVD GMV-835DVD, or on DOWNLOAD. 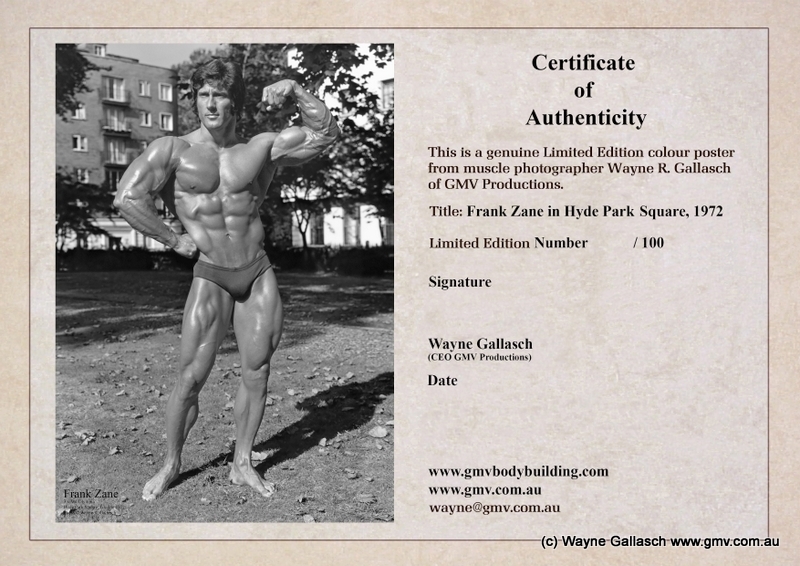 Be one of only 100 people in the world to own this classic FRANK ZANE poster.